You find yourself unemployed. What do you put on your LinkedIn Profile? Do you announce your availability or would doing so reduce your attractiveness as a candidate? Fortunately, you have several strategic options. As you consider the options that follow, the primary consideration is this: How would a HR recruiter or hiring executive react to the strategy you use for the level of position you are seeking? After we discuss the strategic options, we’ll discuss factors that could influence your decision on which strategic approach to take. End Date on your last Employment. Your first option is to list an end date on your current employment. It’s honest and your profile is up-to-date. Viewers of your profile can draw the conclusion that you are currently unemployed in your chosen field. However, there is a more effective approach. When HR recruiters search LinkedIn for candidates, they use keywords to find qualified candidates. The headline area is one of the places that the LinkedIn programming and algorithms look for matching words. By only announcing your availability, you lose your ability to put keywords in your headline which reduces your chances of being found by a HR recruiter. There is a way to get the best of both worlds. Remember, LinkedIn gives you 120 character spaces. So get your keywords in your headline plus “Seeking Opportunities.” For example, “Banking Professional Specializing in Commercial Lending, Seeking New Opportunities.” This strategy capitalizes on your keywords and announces your availability. Your Summary section is also an area where the LinkedIn programming and algorithms look to match keywords. There is a strategic advantage of adding a sentence or two with keywords about position types, industries, types of companies that would interest you. For example, “Actively seeking a new opportunity as an account manager in the employee benefits industry.” This can help tighten your search but be aware that it can also reduce potential opportunities. After you make this statement, continue with the rest of the summary in traditional fashion. List Your Availability as Your Current Employment. The consideration with this approach is the LinkedIn programing and algorithms look at position titles and position descriptions for matching keywords. So simply putting “Open to Opportunities” as your title does not take advantage of the programming. A better approach is stating an actual title or job function followed by “seeking opportunities.” For example, “Sales Operations Professional Specializing in Healthcare Seeking New Position.” You have 100 character spaces in the title area which is a lot room. You could re-word your headline and put it here as well. For the Company Name, you can put “Unemployed.” But, that sometimes can carry a negative stigma – though the weight of that stigma has faded in recent years. Instead, consider a more positive approach, such as putting “Exploring a Career Move” or “Seeking New Position” as your current employer. Create the messaging to put you in the best light. According to LinkedIn, there is now a 200 character minimum and a 1000 character maximum in the position description area. If you were terminated for performance, it’s probably best to leave that unspoken and use the position description space for other strategies. The position description space is an area where the programing works to match keywords. So using your keywords here works to your advantage. So, what do you put in this space? You have a lot of latitude regarding the content. It is recommended that any messaging be reasonable short and to the point. Description: Was subject to a company-wide lay-off affecting over 100 employees at Insurance Company. Release was not performance related. Seeking an account management position to benefit an insurance organization with proven skills in client service, ACA compliance, implementation, renewals, and claim resolution. Do Nothing At All. The final option is do nothing at all and if asked about your profile, go with “I forgot.” This is not ideal, but the option is available to you. Which Strategy would be Best for You? The correct strategy(ies) depends on your unique professional circumstances. You may choose a select combination of approaches. If you work in an industry where it is common to hire on a project basis, contractor-to-hire, or consulting basis, announcing your availability using these strategies makes good sense. The level of your position or positioning on the corporate organizational chart of the position you are pursuing also has a bearing. Speaking generally, these “announcement” strategies may be more acceptable to lower, mid-range, sales to management roles rather than true senior management, executive, or C-Level positions. Exercise your professional judgement as to whether or which strategy(ies) to use. Your strategy hinges on how you believe a HR recruiter or hiring executive for you desired position could respond. 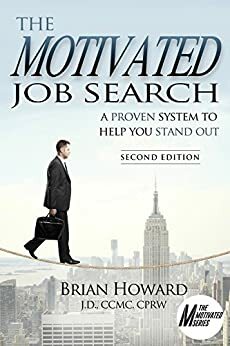 About the Author: Brian Howard is the author of the recently released job search books, The Motivated Job Search and The Motivated Networker. He is a Certified Career Management Coach (CCMC), a Certified Job Search Strategist (CJSS), a Certified Professional Resume Writer (CPRW), an actively practicing executive recruiter. I am pleased to announce the release of The Motivated Job Search book! I wrote The Motivated Job Search for career-minded professionals who want simple and direct answers on how to conduct a job search. Most job seekers do not know how to effectively conduct a job search in today’s job market, which is completely understandable. The skills to find a job are not exactly top-of-mind. The Motivated Job Search takes you through a step-by-step job search process and teaches you how to stand out and get the job you want! The Motivated Job Search covers meaningful topics like how to correctly prepare for a job search, profiling your next job, understanding the employer’s mind, branding, elevator speech, success stories, LinkedIn, networking, social media, and how to penetrate the hidden job market, along with a myriad of useful job search tools not otherwise written about in other job search books. The book promotes a self-motivated job search approach where job seekers proactively engage the job market and employers in meaningful ways that result in job offers! Check out the book on Amazon, or purchase it directly (most cost effective way) from the publisher, WriteLife Publishing (an imprint of BQB Publishing Company). About the Author: Brian Howard is a Certified Career Management Coach (CCMC), a Certified Job Search Strategist (CJSS), a Certified Professional Resume Writer (CPRW), and an actively practicing executive recruiter. He has helped thousands of job seekers over the course of his career. With over 23 years of real world recruiting experience, he has received various accolades and international acclaim for his recruiting ability, and is a member of an international recruiting organization’s “Hall of Fame.” It is from this experience and knowledge that he wrote The Motivated Job Search.